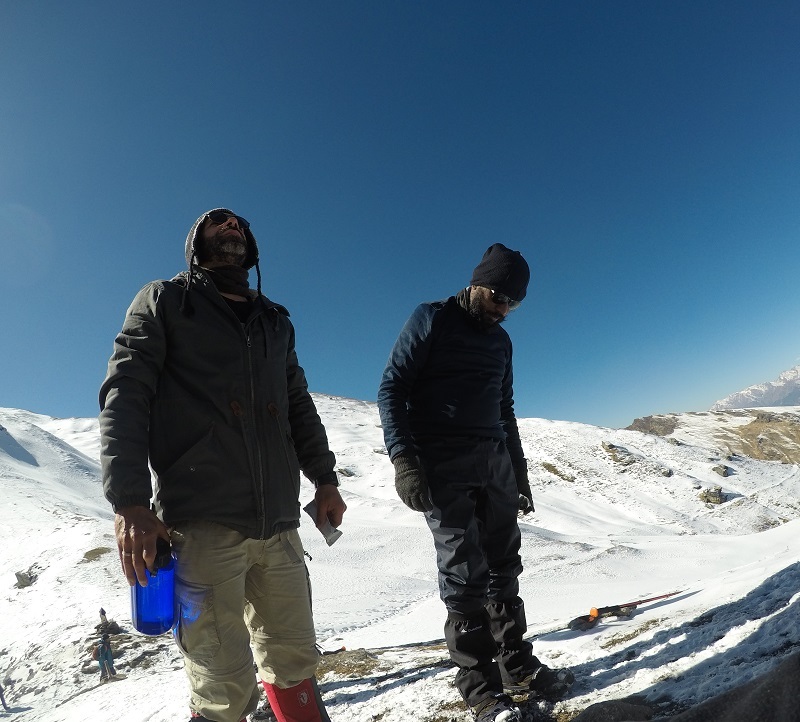 From our adventures in Hawalbagh, we headed towards Joshimath to initiate our Winter Kuari Pass Trek. 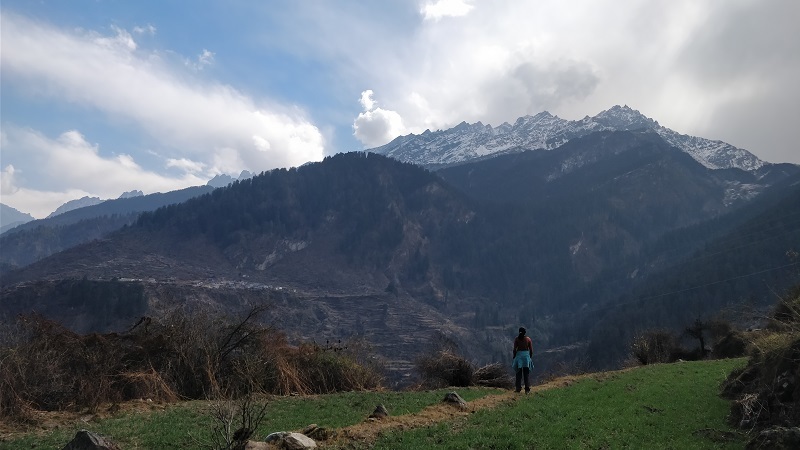 An early morning bus ride from Kosi to Karanprayag (six hours), then a shared cab to Chamoli (about two hours) and then a cab from Chamoli to Joshimath (two hours). Landslides and felling of trees slowed us down. 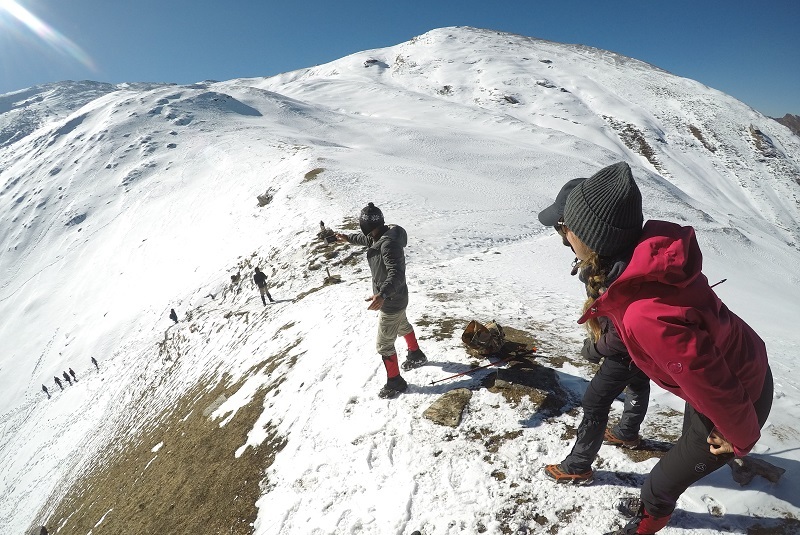 In the Himalayan climbs, things can change very quickly and challenge your wits. You need to pack the essentials and a nerve for adventure. 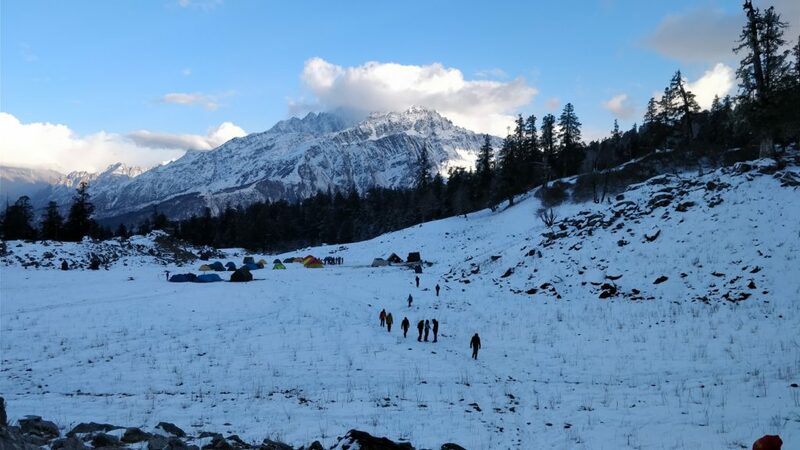 Most trekking groups organize transit package from and to Haridwar for the Kuari Pass trek. 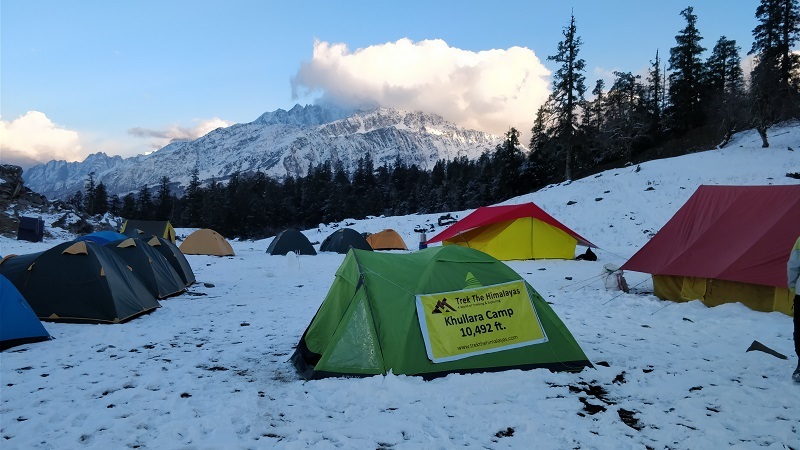 The congregation point for the trekkers to assemble and stay the night is Joshimath. 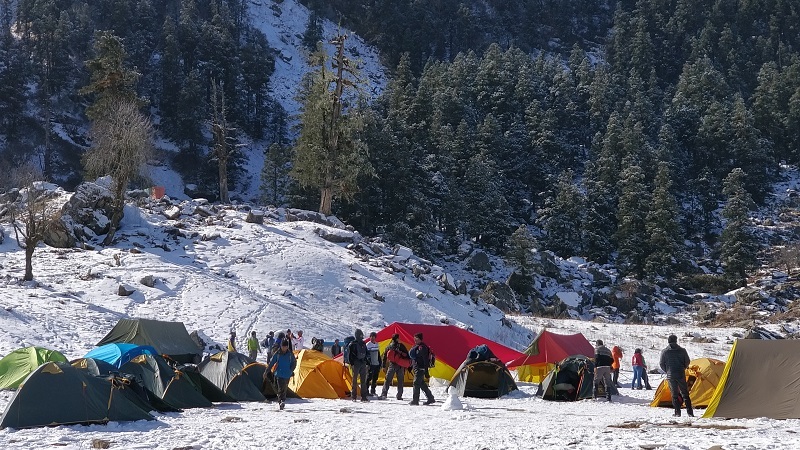 On 31 Dec 2017 (yes that is where we spent our New Year’s eve), our trek group assembled for the trek briefing and dinner. We came face to face with strangers, many of whom will become friends over the next several days. 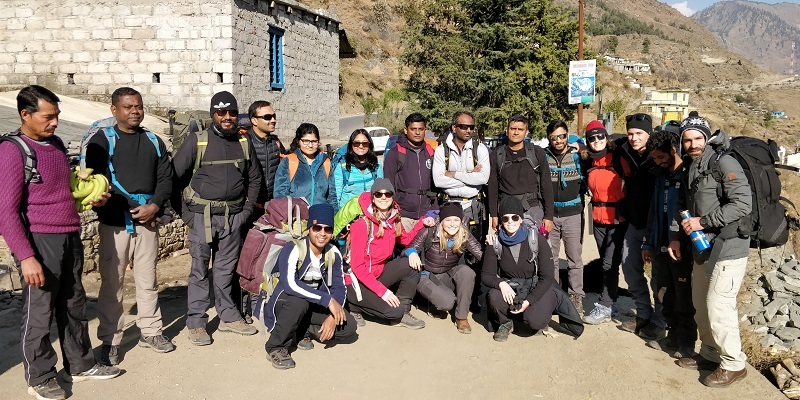 People from various parts of India (Chennai, Bangalore, Pune, Delhi and Kolkatta) and world (South Africa, Australia and Switzerland) found themselves in a small dining area without a common language. 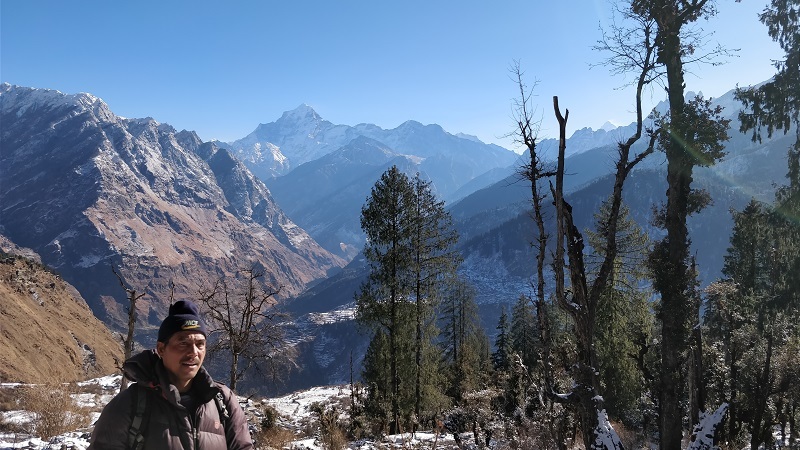 Our trek leader wanted someone who could translate – I volunteered. I could translate with ease across three languages in that room, Hindi, Tamil and English. Trek briefings are fun with interesting introductions, instructions and a bit of inspiration. There was a nice new year celebration with cake cutting. In the morning, first day of 2018, we loaded our backpacks on the Tata Sumo. There was a 12 kilometer drive to Dhak village from where our trek would start. 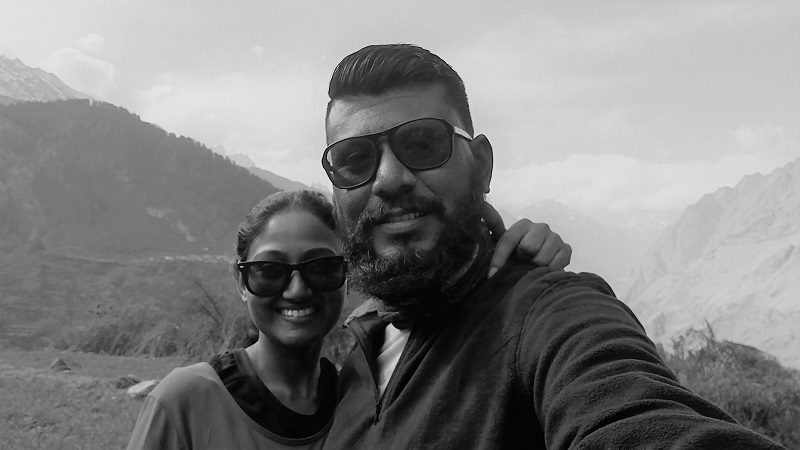 The drive presented some mind blowing Himalayan views. It vetted our appetite for grand views in the days ahead. We got down at Dhak village and by now the sun had come out. Beautiful mountain sun warms you in no time. 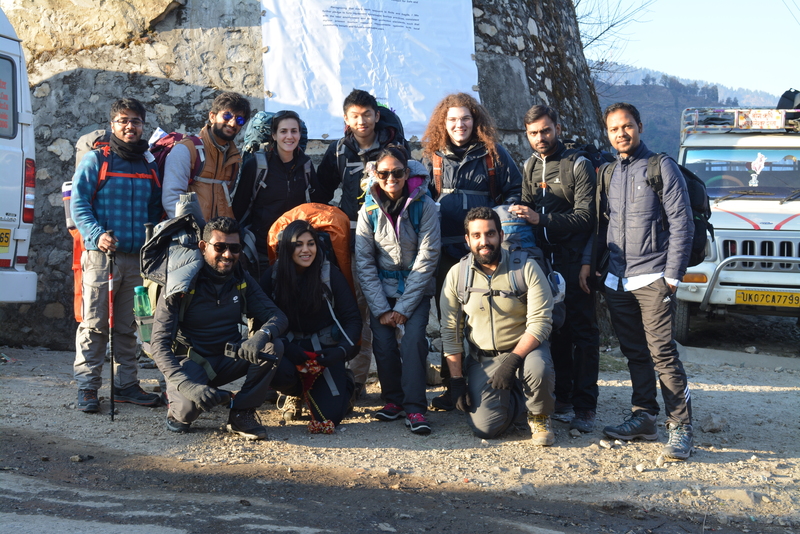 We all assembled for a group photo before we started our Himalayan trek. 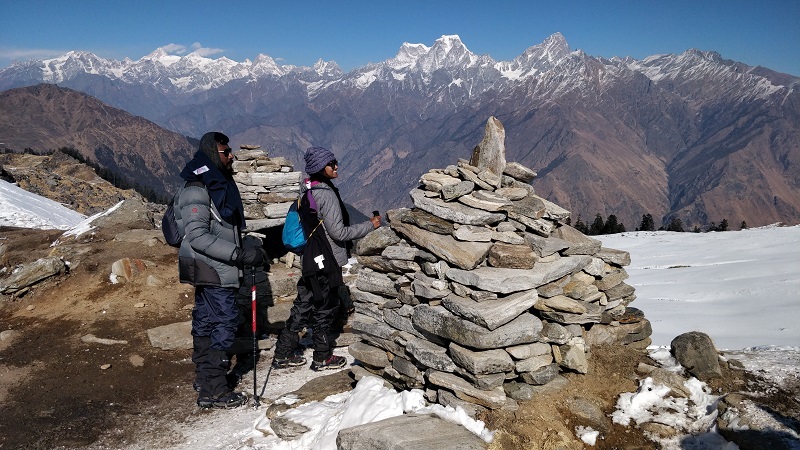 We started trekking up to Tugasi Village (~8000 feet) which is about four kilometers from the starting point. En route we were greeted by beautiful people, their self sustained communities, amazing mountain views, sweet sound of cowbells and contrasting beat of mule hooves on the ground. A good way to test if you have romance in your heart is to reflect on what all of this does to you. It did a great deal to me and from what I could tell, it did a lot to our trek buddies. More smiles, longer gazes, a sense of freedom and triviality. 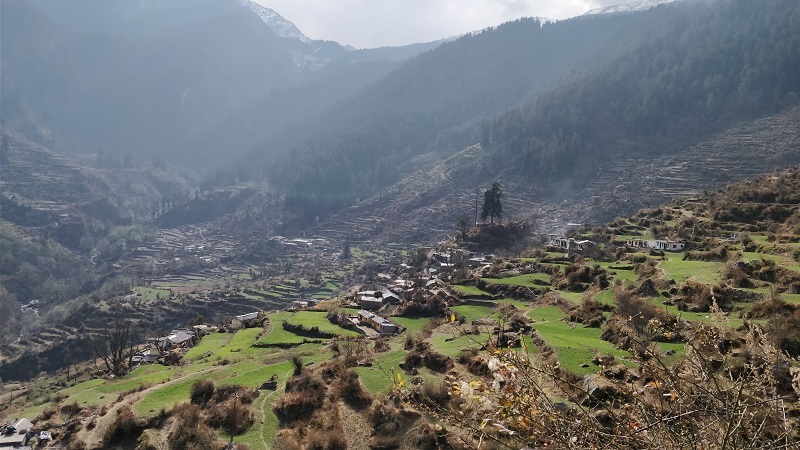 From the Tugasi village, we climbed towards the Gulling village (~9000 feet). Another two kilometers or so. were trying to find their tent partners – it is always interesting to observe how this plays out. Everyone is a bit nervous and cautious. It is always good to have a wavelength match with your tent partner on such treks. It could be heaven or it could be hell. 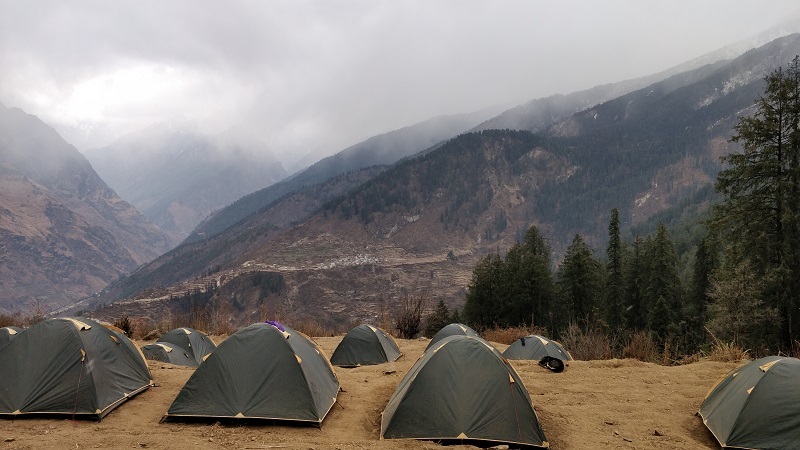 All our tents were facing the majestic mountain view – the fabled Mt Dronagiri. We retired into our tents for some time. 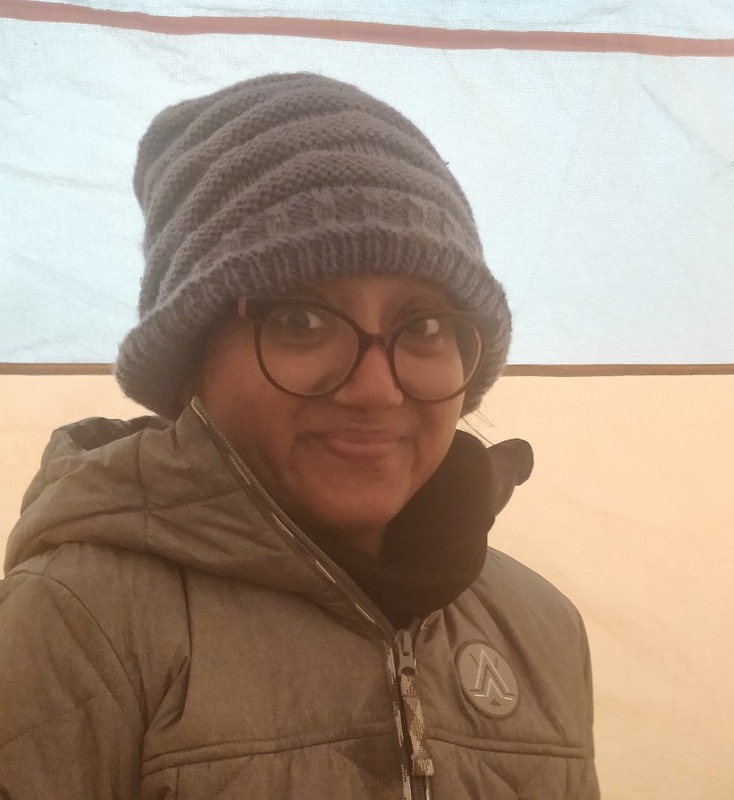 In about thirty minutes, Chanchal and I heard some commotion around our tent. 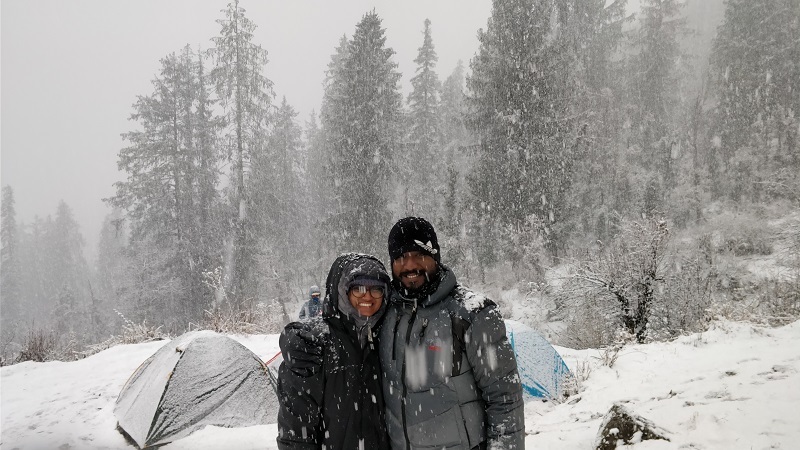 Excited voices of some of our trek mates – it is snowing! Like a gust of wind, we both got out of our tent. The sight was surreal. Snowflakes were raining down from the sky. The weather had suddenly changed. All around as far as we could see was just this feathery white thing floating through air and gently falling on us. 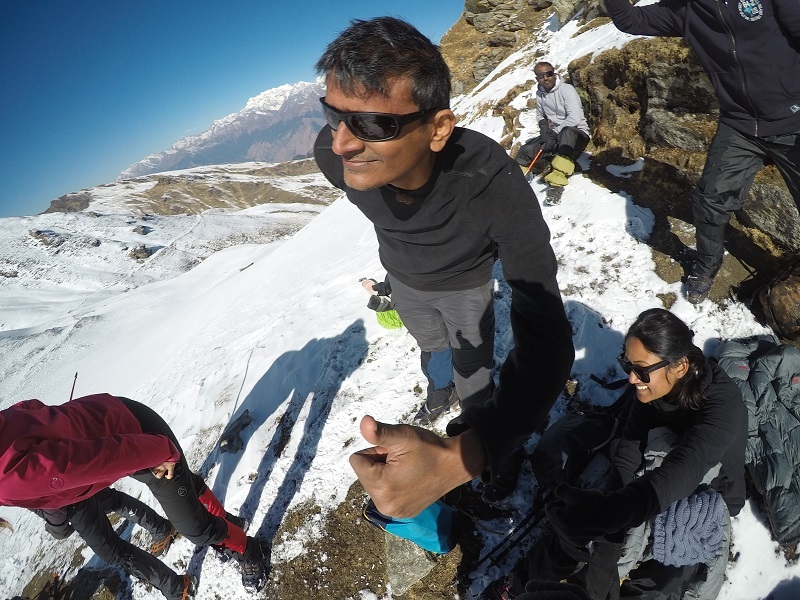 I remember Karthik (our trek mate from Chennai) shouting – ‘look up to the sky’. We did! And that was the first magical moment of our trek. Time suddenly slowed down. With our head tilted upwards, we just gazed into the sky as the snowflakes danced through the air… it was literally like experiencing life in slow motion video mode. From then on, the snow kept falling. What was like a chocolate mud cake when we walked into the campsite was now like chocolate and vanilla ice-cream. As the evening progressed, it turned into vanilla icing with no other visible color. As an amateur painter, I am never able to superimpose white over any other color without the background color making its presence felt. Mother nature has her ways. The night was cold and long. 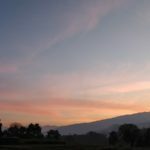 I wanted to wake up early and watch the sunrise and if possible capture a time lapse. Nature’s call is the best wake up alarm. 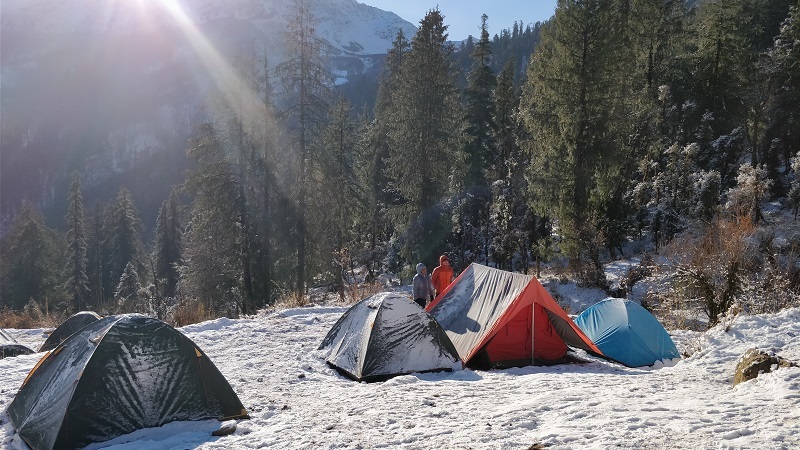 To get out of the tent, one need to get out of the sleeping bag, layer up, wear shoes that have been left in the snow overnight and do all of this while within the small enclosure of the tent that has frost on the inside. While coming out of the tent is a tedious task, the view outside is what makes you forget all of that. The mountains were getting ready for the sun to rise slowly and the cold biting wind to give way to the warm blanket of gold. If you are in the mountains do not ever miss the sun rise. After breakfast, we all were ready with our backpacks and snow gaiters. The climb started. The oak and rhododendron forests drenched in snow gave us visual treats. You can only imagine how the forest and meadows will look without snow. Due to the snowfall overnight, the leaves were all covered in snow. You could go shake tree and prompt an instant snow fall. Many of us slipped as we continued our ascent through the tricky slopes. 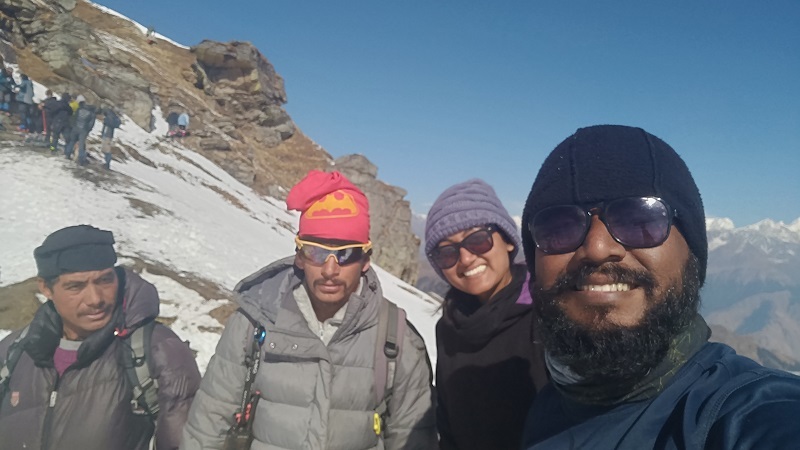 Our trek leader Naveen and our trek guide Guddu helped us through the challenging stretches. Our tents were pitched on a bed of ice (something we only discovered the morning after). As the night fell, the temperature started to dip drastically (we realized it was somewhere in the range of minus 12 to minus 15 degree Celsius). I have personally not been in a colder place than this. The only things between ice and our bodies were a Styrofoam sheet, our sleep bag and our clothes. The tent was perhaps not suited for sub zero temperatures. As the night slowly progressed, the insides of our tents developed a thick layer of frost inside. My mustache and beard were crisp with a layer of frost. The water content in my breath was settling as frost on my stache. Bizarre and scary. That night I could hardly sleep. Same story with Chanchal. I was dreading the morning, as we had to get up early and start our trek to the summit. The long and strenuous day lay ahead of us. Alas! 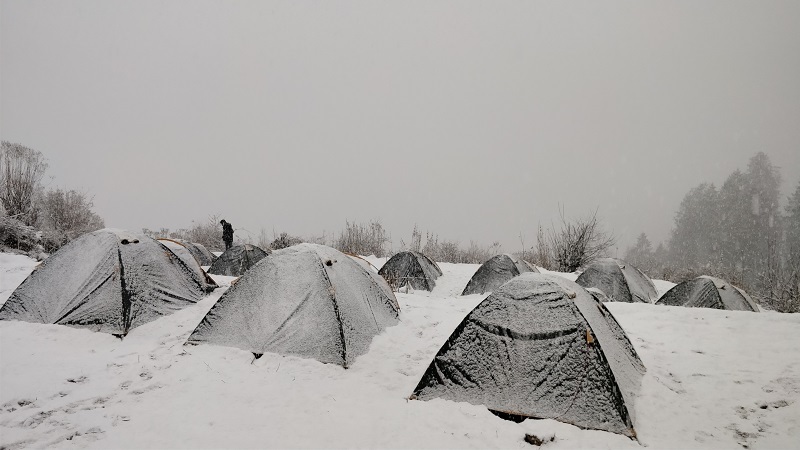 Many of us could not sleep.Our trek leaders agreed that the tents were not suited for this clime. They had brought out the matter to the TTH organizers – but to no avail. The previous night at the dinner tent, we were given crampons. These are a must if you hope to summit on a snow-capped mountain. Since the ascent is steep and long, with no water source enroute, a tough and testing day ahead. 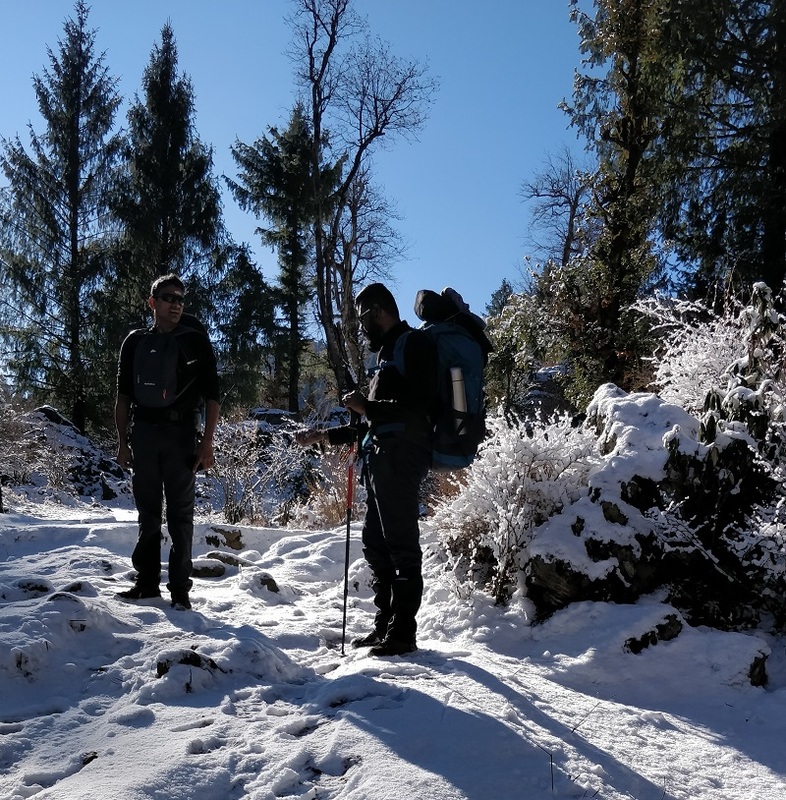 This trail is famously called the Lord Curzon trail after famous former viceroy of India and ardent trekker. Apparently, he was the first one to scale this pass and whence he asked the locals what the pass is called they had no name for it. 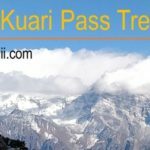 They just said that is a Kuari (meaning Virgin) pass – meaning no one has ever scaled it or given it a name. 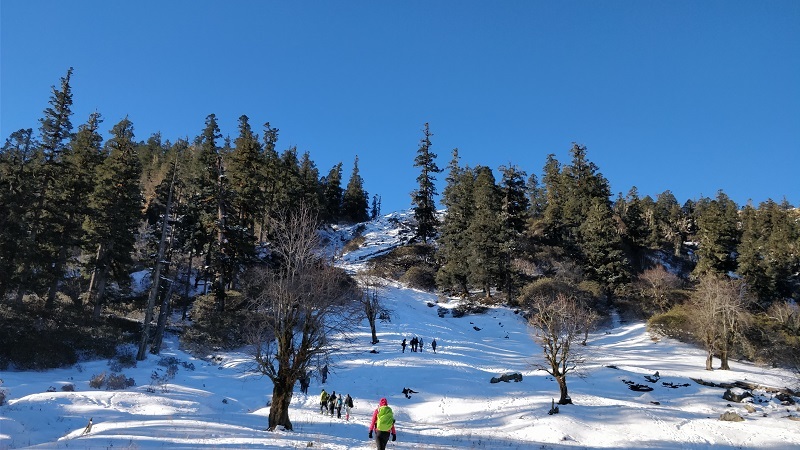 One of the treats of a winter Himalayan trek is the walk through the snow covered and seemingly endless bugyals (meadows). Wherever you dart your eyes, there is just a sea of white. When the rays of the sun land on the snow, it makes for a surreal experience. Seems as if molten gold has been poured over pristine milk. 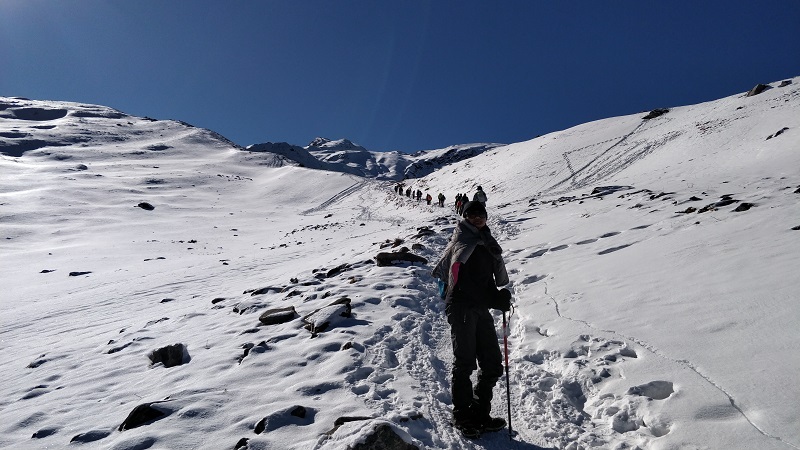 Our trek group members formed a linear thread through the vast and white bugyals. I realize how much we miss this sense of proportion and silence in the cities. For hours, you only hear your heartbeat or an occasional banter from a fellow trekker. 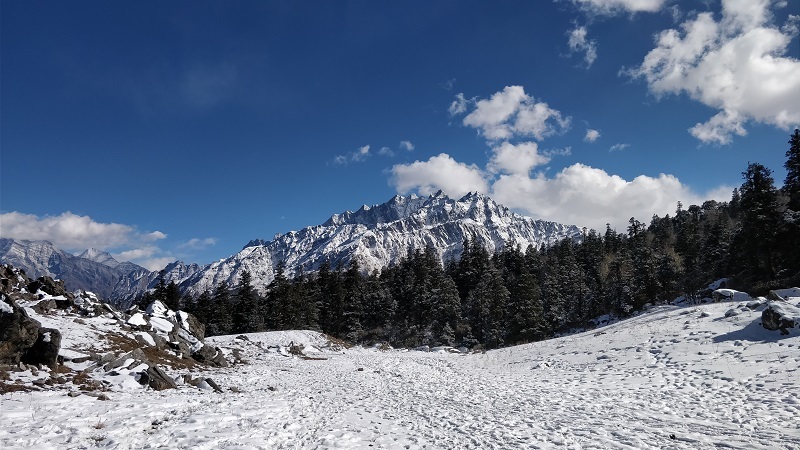 Nanda Devi biosphere is a gateway to the big mountains of the Indian Himalayan range. 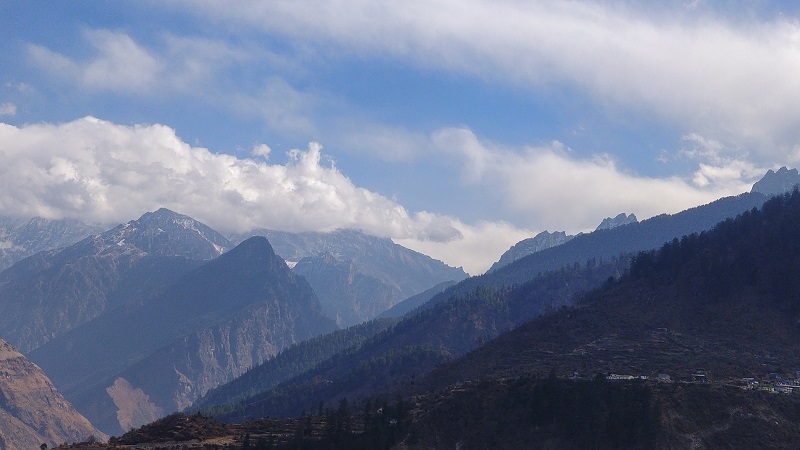 As you trek through the alpine range, you are greeted by vistas that are breathtaking and divine. At certain vantage points, you can clearly see Nanda Devi, Drona Giri, Trishul, Hathi Parvath, Chaukhamba, Kamet, et al. You cannot escape the sense that you are on a expedition. The awe is just superimposing. 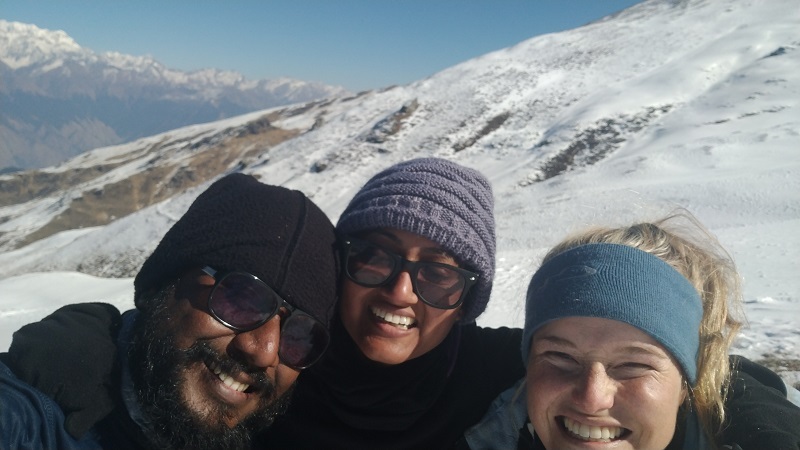 If you are getting older and still want to have a fighting chance of making new friends, I strongly suggest that you go on treks with strangers. You are bound to come back with friends. How many activities can guarantee that? Not many, I guess. 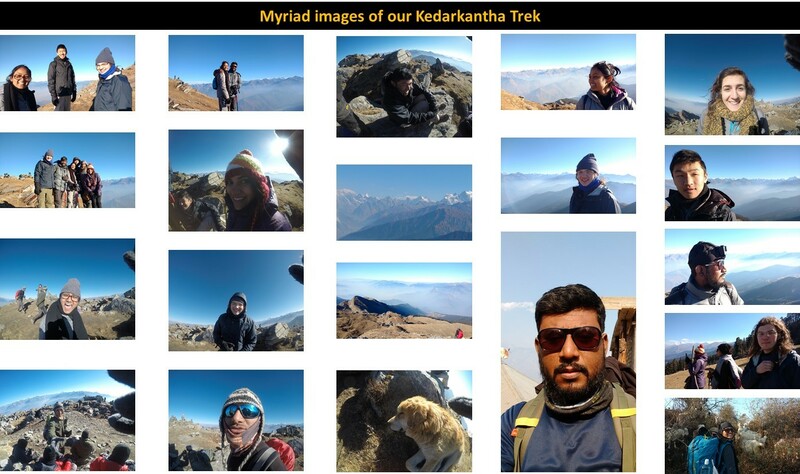 We had some amazing conversations with our fellow trekkers. The sheer relief of not having mobile connectivity or access to any screen device cannot be put into words. Long and frequent conversations with Karthik, Mani, Vivek, Adam and Raj. You get interesting perspective and insight into other people’s thought process, what such a trek is doing to you and them. I had a moment of realization… on a such trek, you could have a rare insight into yourself or onto life in general and you want to share it with someone. At that specific moment you may only have a stranger’s company – and you let it out. You share the rare and precious insight. A moment of exuberance, vulnerability and timeless strength. You may after that share it with your loved ones, but it is wee bit watered down. I had one of those on a long and endearing stretch on the snow-laden meadow during the summit day. Rhododendrons, Pines and Oaks! The Himalayan Oak forests are a thing on to themselves. The walnut trees sprinkled liberally over the mountainous terrain stand in scrawny strokes of life lines. 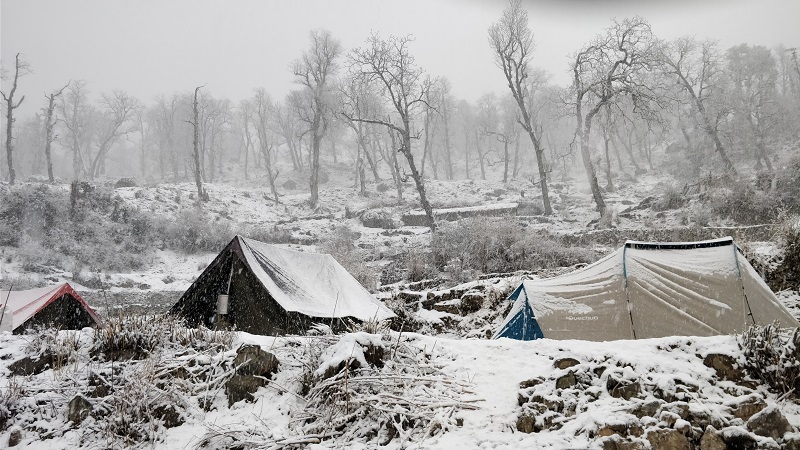 When juxtaposed against the somber after hours of a dense snowfall, they can evoke a deep sense of dissolution that seem unique to the spiritual fabric of the Himalayas. 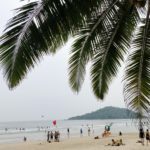 On the other hand, with stretches of Himalayan forests covered in lush Oaks and Pine trees and vibrant Rhododendrons can be what brings the inanimate to life. Sort of what could have called the universe to life and expand. 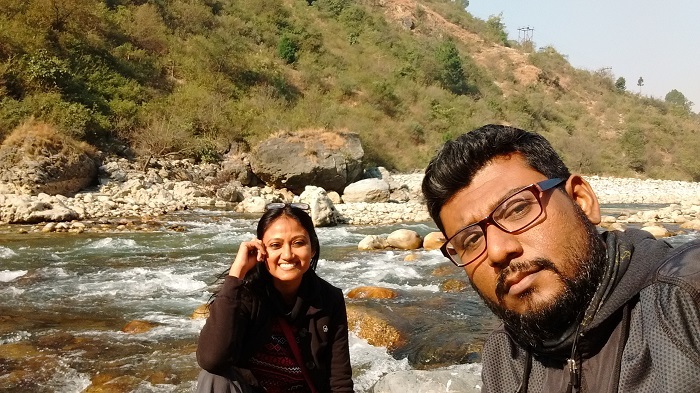 We trek through five rivers in our trek route: Pinder, Kalignga, Nandakini, Birehi ganga and Dhauli. Some more like stream than wide gaited rivers but surely alive with the exult of mountain riparian spirit. There is just tremendous life in each crany and crevice that you are filled with all that is great and unflinching in life. 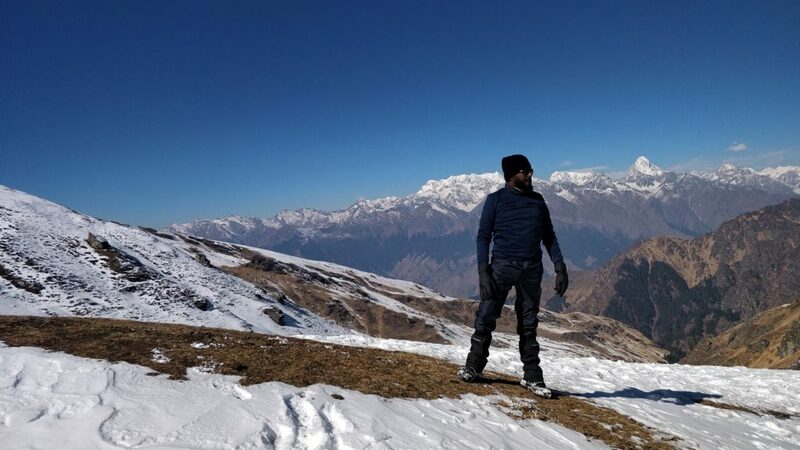 Having done a few treks already, I have come to realize that the feeling of summiting (at the time when you do) is very different than the build up to it. 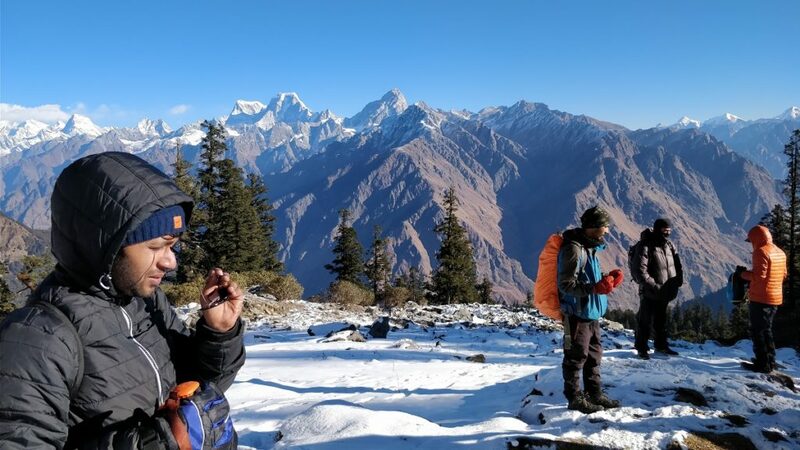 During the trek preparation, as you continue to climb up the mountains day after day, there is thrilling sense of adventure, a surge of testosterone to culminate in a feeling of conquest. But, when you actually summit, what you really feel is speechlessness, emotional overwhelming, deep and saturated feeling of humility and at once a break through in life. It feels the exact opposite of what you are programmed to feel. In that it is one of those rare true moments of life. After hours of pulling ourselves through the cold snow and scorching sun, we finally made it to the top. Rationed water supplies, fluctuating electrolyte levels and just dealing with our limitations. Everyone had generous smiles on their faces. It was time to eat – our packed lunch came to the rescue. We did the hugely popular summit group photograph. And then all sorts of frolic ensued. People were climbing up cliffs and striking yoga poses, selfies and photographs. You ought to enjoy this as well. A shared sense of happiness and achievement — the power of collective exuberance. In about thirty minutes, we started our descent down to the Khullara campsite. It is then I realized I was running a fever and perhaps a heat stroke on top of a cold mountain. The Himalayas can be quite taskmaster. One bad move and you are asking for it. I layered down and started drinking as much water as I could borrow from others. Came back to the campsite, exhausted and unwell. 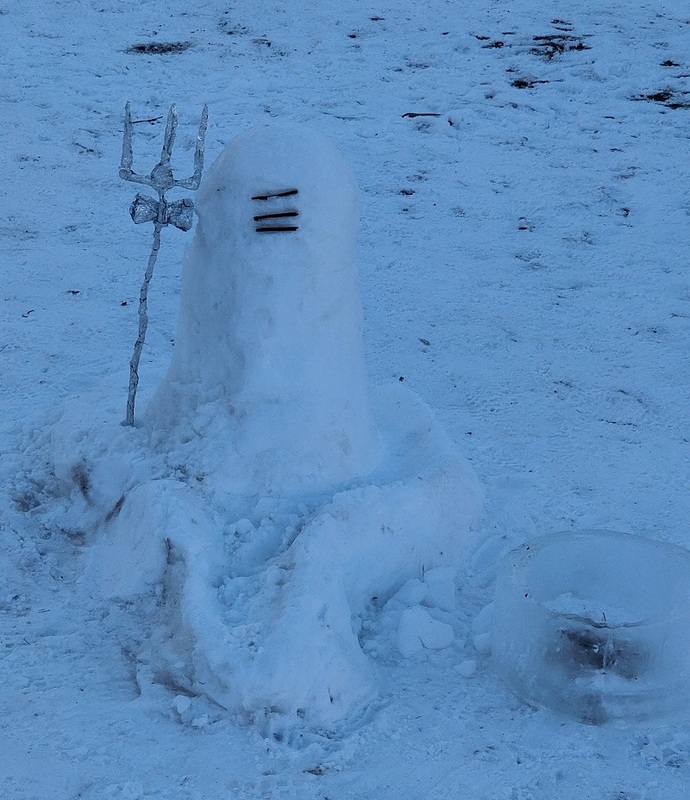 I took everything I could – good advice to play out the fever (by actually playing Frisbee in snow), drinking concoction of Indian herbs and popping a paracetamol. All of these seem to somehow work together. I started to feel better in about an hour. Tonight was our last camp night. 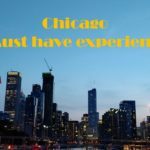 Everyone was getting a bit emotional and wanted to share stories, highlights and lowlights. I realize no matter what age you are camps make you teenagers again. We share stories, laughed and felt comforted in each other’s company. So it was time to make our final descent to the Dhak village. The snow that we found on our way up had turned to solid and slippery ice now. We did not have crampons to navigate our descent. Many of us kept slipping and falling – I personally fell seven times. 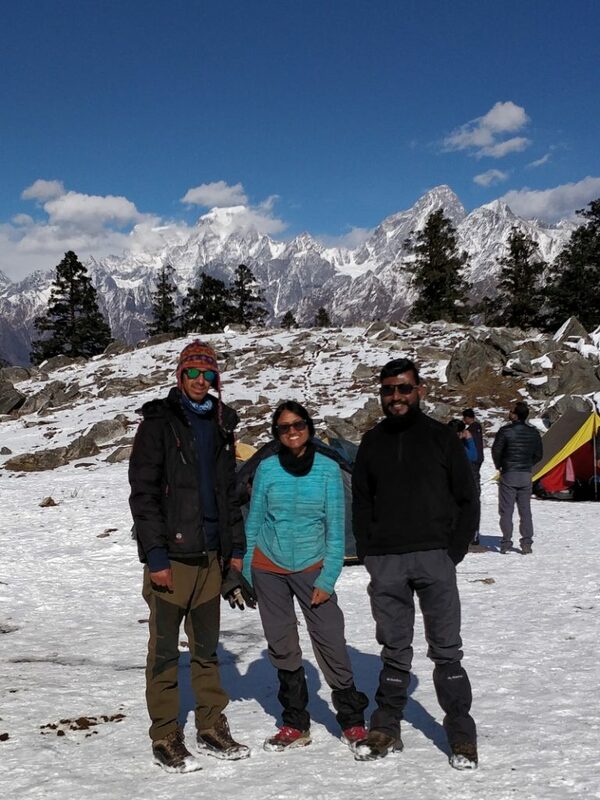 Naveen and Guddu – our trek leads – helped me learn a new skill. The skill to rapidly decent through snow by making long strides and hitting the snow down hard with your heels. Like a marching soldier. I avoided the trail which was now ice and instead took longer detours through the forest to find areas of deep snow through which I could descent rapidly. This is a life skill I learnt. Through our descent we saw a different side of the villages. When we were climbing up, these were cold and dusty and now they were all covered in snow. Life here changes drastically overnight. You also realize that with all the adventure you just had is a memory. Life is lived in short bursts of moving images. Until next time, keep climbing.